After years of waiting I could buy a digital SLR camera and use my old macro-lens, extension rings and ring flash unit. My previous camera was a Dynax 500si, a 100 mm AF macro lens and a 1200AF ring flash controller and flash unit. Although stated the 1200 AF controller did not work with the Dynax 7D. 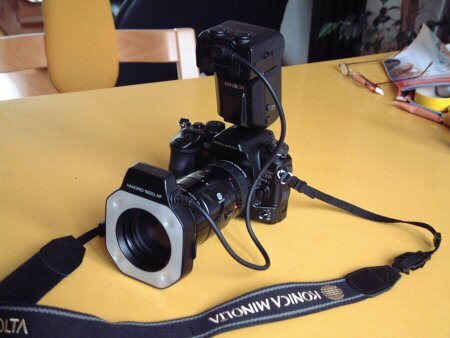 I had to buy a MFC1000 controller (300 Euro) but could use the 1200AF flash unit (also 300 euro). After all, the entire unit is much faster in recharging and very economical with its power. I could use the unit with four 2200 mA rechargeable batteries for more than 300 flashes. Even after 300 flashes charging time of the unit till a new flash was short and there was no sign of fatigue. When I bought the camera I received one power pack for free. This is a need. The camera drops dead without a beep. Maybe the indicator tells you when power is falling but during the hunt on spiders this will not be noticed. 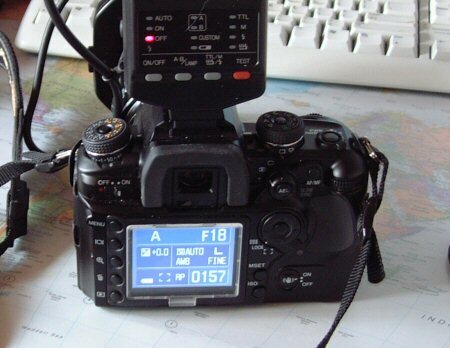 Over 200 pictures can be shot with a charge if the camera is in manual focus. Also check the large display for dead pixels. I had one dead pixel and it was no problem to change the camera in the store where I bought the camera, but it can be a problem if the camera is bought by internet resellers. The camera can do many things and is loaded with knobs and dials. It is really a "boys toy". Because of the nature of macro photography a lot of the features are not used or turned off and I can not comment on these. Operation is simple if you want to use the camera unit for macro photography of spiders and insects. I always use an extra extension tube (ring) of 36 mm and sometimes 72 mm for spider photography. For objects of 20 mm and larger the extra extension tube is not needed. Turn on the camera. The camera is very fast, almost instantly, to use. 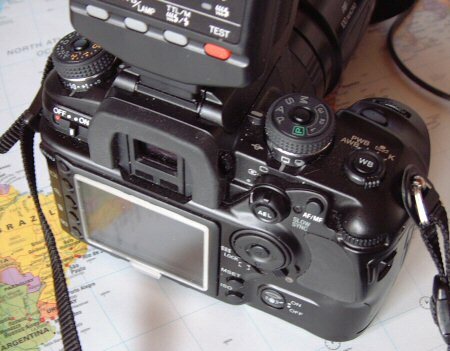 Turn of auto focus with a button on the back, turn the dial knob to A or M, set diaphragm to F11 or higher and turn on the flash. With 2020 grams the camera plus flash unit is not light. The camera it self is 760 grams. The antishake stabilisation system can be turned on during macro photography. It is difficult to see the difference between the anti shake on or off. If you have enough power than you can leave it on because it does no harm. If power becomes an issue one can save power and turn it off. with a AF Macro Zoom 3X-1X antishake has to be turned of according the manual. Walking around and moving in on the spider is similar to what I was used to do. Only the distance to the object is 50% further away because of the cropping factor of 1.5. Flash synchronisation is set to 1/60 second if Mode A (Aperture) is chosen. 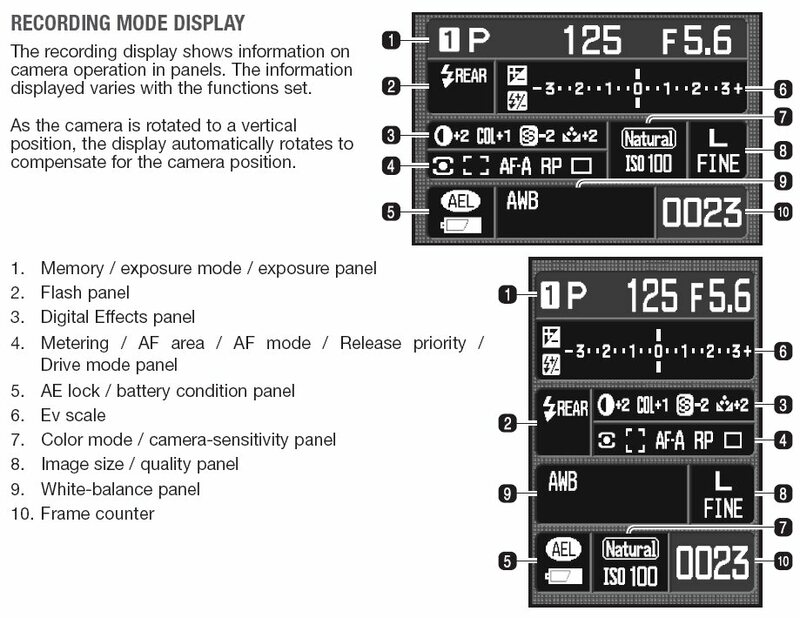 In Mode M (Manual) the synchronisation is set to 1/125 sec or longer, you can change the shutter speed in M mode. I am not sure if 1/60 sec gives unsharper pictures than 1/125 sec, but I would have preferred 1/125s in Mode A. 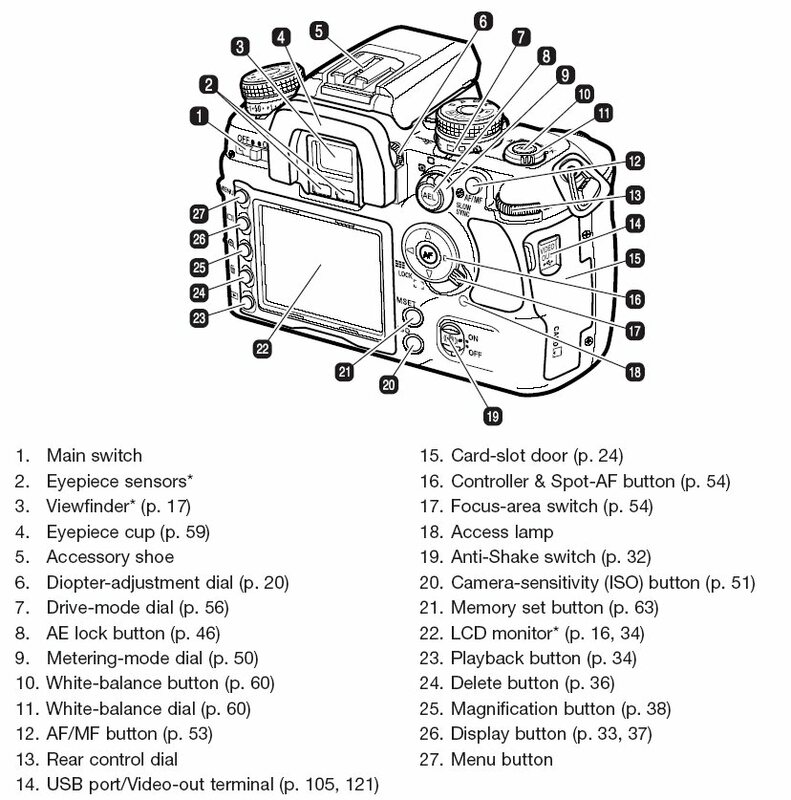 The camera is compatible with High Speed Sync with the Program Flash 5600 and 3600 HS(D) flash units. Speeds of 1/4000 of a sec can be used. The flash flashes before the mirror is up because the flash can be seen throught the lens. Sometimes insects and spiders react on the preflash and are gone before the pictures is recorded. 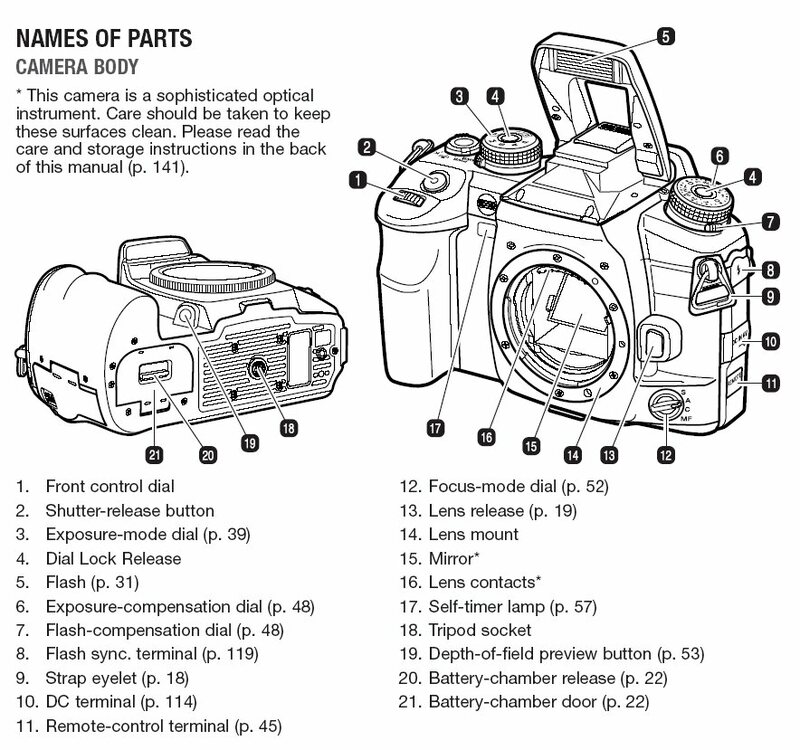 There are several flash modes but they depend on the lens and flash unit you use. The filmspeed is set to Auto but you can choose between ISO 100 - 3200. With a flash there is no need for high speeds. The large display is very informative and readable for persons that need glasses for reading (D+2.0) but do not use them in the field. In the bright sun the screen is still readable but it is very difficult to judge pictures. Even in the dark the judgment of pictures is difficult. I even found it difficult to judge pictures on a laptop. At first instance I was very disappointed. When I projected the pictures on a CTR screen the pictures became bright and sharp. The information in the viewfinder is more than enough. One can save pictures in RAW mode, extra fine, fine and standard JPG at several resolutions. I did not notice a visual difference between extra fine and fine JPG. About 1000 Mb were used for 500 pictures in the fine JPG mode at 3008*2000 pixels. Almost all pictures were from spiders or insects I have the camera standard on Fine at 3008 * 2000 pixels. 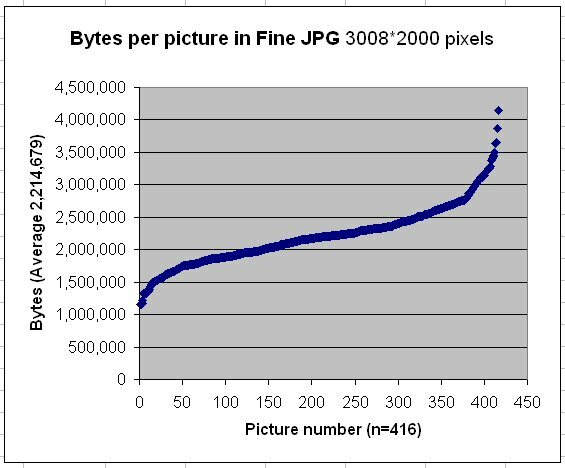 The graph shows shows for every of the 416 pictures the size in bytes. The difference between the size of a picture can be seen with these two extreme file sizes. The camera gives better results than my Nikon Coolscan III film scanner with negative or positive films. Colours are brighter en details sharper. The pictures are crispier. At first instance the camera is heavy is comparison with the Dynax 500Si. But with all the gear connected on the camera the few hundreds grams difference is not a problem during field work. The possibilities are enormous. After four months I still do not have al the possibilities in mind. The manual is only in PDF-format on CD and that is a draw back. It should be printed on paper. One major draw back /advantage of digital cameras is the crop factor of 1.5. All your lenses gets an extra magnification of 50%. So your 28-80 mm zoom lens becomes 42 - 120 mm. It is great fun to have the pictures ready the same day the pictures are shot.